With us you catapult your German from theoretical grammar to active understanding and speaking and finally make the leap into German culture! >> Click here to become a family member! show all videos in your class room! All videos can be downloaded (with German subtitles). So you are independent of an internet connection. You can download the soundtrack as an mp3 podcast and always hear authentic German on the go. Each video has a worksheet with solutions and additional files to work with. There are the subtitles as text. So you can listen to the podcast and at the same time read along and speak. A catapult for your German! If you teach yourself, your students will love your classes even more! Texts and worksheets are available as PDF as well as DOC. If you teach yourself, you can easily adapt it to your needs. I just wanted to write very quickly to say how great I find your online-host-family-project. It is truly unique and gives students of the German language such authentic insights into the life of a German family and more generally what life is like in Germany. A super idea! Here you can become active yourself and get to know others as well as ask questions about grammar and culture. Peter will help you in language questions; and of course to our videos. You do not need to be afraid, even beginners are welcome, we all support you! >> Mehr Videos von unseren Mitgliedern! The membership is great for me. I have the opportunity to see how a normal family lives in Germany, what habits are there, with all the details. I appreciate the insight into private life with various topics. I also appreciate the open way you talk about everything. And it’s also great how your wife, son and other family members are involved. 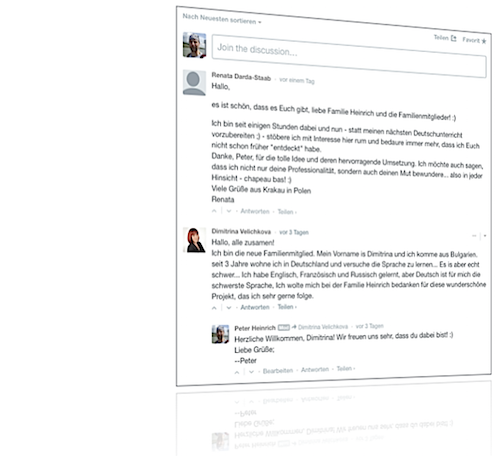 It’s like a reality show with slow comments, ideal for learning German. It is entertaining and at the same time instructive. I became a host family member because I wanted to improve my German to work abroad as well. I find the videos with the subtitles very useful for my method for German. In the video, I pronounce the subtitles, then I read each sentence many times, trying to pronounce correctly and finally repeat it by heart. The project with the videos is just great! I congratulate you, because you do it with dedication. I really like it because I have a little bit of contact with the German language. Since my way to work takes about an hour, I can download the videos and watch or listen in peace. In addition, it gives me the opportunity to get to know or even see much of what belongs to German culture. Thank you very much for this great and very interesting project! For me, membership means a lot, because I am with the Germans and also with the other members. All this makes a special motivating feeling! I like to see all videos of Heinrich family. I think the idea you have is very great and you can learn many things about German and the culture and traditions in Germany with the videos. I would like to congratulate you on this project! You are very nice! Thank you for your tireless innovative “home school work”. It is very pleasant and interesting to be your student. You have so many good ideas to learn German, but this is the best, in my opinion. I am very happy to be with you. “The host family” is the absolute best Internet source to get to know the German language and culture. No matter if you are learning German yourself or you are a German teacher and you are looking for supportive teaching material – or just want to perfect your German. In the host family project you will find motivating videos and a very friendly cultural exchange. I learned more German from this website in one month than anywhere else in a year! Keep it up! I work as a freelance foreign language trainer and coach in Hungary, in a fairly large city. As a language coach, I am always looking for new ways to motivate my coachees; I am always on the lookout for new materials. The keywords in this review are always authenticity, effectiveness, and fun. All this I find in your project, which pleases not only me, but also my students. They always look forward to the new sequels of your “soap opera” (in the good sense of the word) and to the new useful expressions that they can use in everyday life as well as in the office. As a language coach, I usually do private lessons, and we just watch the videos every hour. The subtitles are very useful, especially at level A1 / A2. Your films are always a nice break for my daily routine and I think about my time in Germany – I studied in Wroclaw, but also in Bielefeld and Heidelberg. It is also always nice to hear your German, because you speak so nice German. My children also enjoy watching the films and are happy to meet their German colleague (Maynard) in their age in the film. I’ve never been to Germany, so I can only imagine what it all looks like in Germany. With the “family” I felt the real atmosphere, saw with my own eyes, how a German family lives. Of course new words are always very interesting to me. Many videos we have already looked at together with the students. Both the students and I are extremely excited !!! I get beautiful videos that help me learn German culture and language better. Although I have been living in Germany for about three years, I did not have much experience with the family traditions of the Germans. I’m Magda Plesa from Romania but I live in Germany for 5 years. I always enjoy your videos. I think it’s great that I – as a guest – can “visit” your family a few times a month ;-) and travel with you, go for a walk, visit beer restaurant: -) ……. make Advent wreaths …. I am from Serbia and would like to improve my knowledge in order to get a job. In Serbia, I have already passed B2 testing, but that is not enough for the medical service here in Germany. Here I have attended a communication course for foreign doctors, and now I continue to improve my German skills. Because I can not communicate with anyone here in Germany, your videos are very important to me. I am so happy to be a part of your family and to experience life in Germany and German culture with you. Because I never really lived in Germany, I miss that very much. I think observing your everyday life is not only good for my German but also helps me with my work. By the way, I like cooking and the videos with the recipes are really nice to me. As you can see in the picture, I have a 3 year old daughter Lisa, with whom I sing German songs from time to time and make finger plays as well as nursery rhymes. I bought something from you about 2 or 3 years ago. Since then, you have sent me emails from time to time. I am very glad that you have invited me to the host family. I enjoy the videos a lot and they helped me a lot. You had a good idea with this project. I like all your videos. This project is very up to date. There I can hear natural German language and get acquainted with the traditions in Germany. Every month I am getting more and more excited about the videos and my membership in your host family. Especially I like the videos for the holidays like Halloween, Advent Sunday, advent calendar, and all the nice cooking and baking movies. Your family is very harmonious and you are all natural. You can really feel your peace and love for each other. Together with your film art, Peter, and Birtes craft and cooking talent you make a great pair. And that Maynard is still small and unconstrained, makes the movies even more natural and lovable. My students usually watch a video 3 to 5 times, answer the worksheets and we discuss the topic – what is different or the same here, etc. Sometimes we go through the whole text again and the students underline verbs, or Accusative / Dative expressions and then write them on flashcards. Their vocabulary has already expanded and they all love being surrounded by German for 12 minutes. We’re all looking forward to the next video, but right now I have more videos than I can handle. I do not want to miss one though. Thanks again for the idea with the host family! I really like the videos because it makes it easier to learn the new vocabulary. When I see the videos, I feel like webb I would live in Germany. Although I can not see it, I turn on the video and I hear it. This is very exciting for me! Peter Heinrich, his wife Birte and his son Maynard with the family videos and vocabulary pages are now a hit with my students. These short videos help to better describe and illustrate life in Germany. We watch your videos with the kids together, and they always ask a lot of questions. I think it’s very good that they find out in this way that there are people (except me) who speak German. Unfortunately, we do not have any personal contact with German speakers. Although I am a DaF teacher, I am out of practice since I am at home with the children, I personally benefit a lot from the videos: as far as the language is concerned, especially the everyday language, which you can learn hard in your own country and The customs of how your family lives their everyday life, to see it, to experience it, is also something special. Whenever I look at your videos, a bit of Germany comes to us. :) And I always long to Germany. My name is Solvor Sundsbø and I’m from Norway. I teach German at a school near Oslo. My students are between 12 and 16 years old. I have shown many of your videos to my students, so that they get an insight into the everyday life of a German family and learn something about the culture in Germany. Cultural studies is an important part of the lesson. I am looking forward to new family videos from you! My name is Donatella and I’m from Italy, Northern Italy. I’m 50 and I’m a housewife. I am also grandma !! I learn German only for fun. I can speak German only a bit and find the language very difficult, but it is also important to learn at least one foreign language in life. I found this site by accident. I find them very interesting and funny even if I understand very little. Unfortunately I have to search the most words in the dictionary …. but I like your blog and try this month to see it .. I like their videos because I can hear and also read the text … I can also see how a German family lives and learn new words. Thanks to the very likeable videos, you have become kind of like a distant family. In the next course I want to show via notebook again and again one of your videos, because I call the volunteer course anyway not German course, but “Germany Course – Life and Speech in Germany”. That’s exactly the topic of your family stories! I am very happy about my membership in the family! First, I learn a lot myself. And for my students it is a unique opportunity to get acquainted with the life of a German family, to hear authentic German, to get to know German realities in such an attractive and exciting way. Doubleless increases the motivation to learn German and gives an impulse to learn even more about the German language, culture and traditions. My students greet you, dear family members! We all like to watch your videos and we really learn a lot of new stuff. You are a nice family and I am very grateful to you for doing such a great thing! Hi! I am Carri, Judith’s husband. I am in A2 level. I know a lot of internet resources for learning german. I have lots of videos, books… And really guys: this is a must have! The best I found since the “ichlingorismus” who also changed my studies. Listenint to a child, real conversations with him, this is unique. I love your recipes also (zucchini uummmh) and I remember the vocabulary while we are cooking or singing. Kathy Jeswein from the USA has finally found authentic material for her students in Germany. Khadyjah from Mauritania learns vocabulary and other content with us that she would never have learned in any other German language course or book.